My house smelled so good this afternoon. As I’ve mentioned before, I love a big pot of soup. 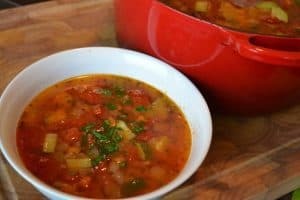 This minestrone soup which is full of veggies, protein, and fiber will warm you up on a cold day. It can be made ahead because the flavor actually improves over time. It is the best kind of recipe, very versatile. I have left out the beef and the pasta and used the base of the soup as a meal starter. 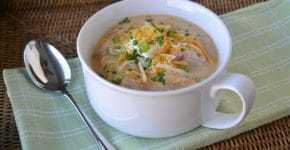 You can add whatever veggies you like, such as red pepper, green pepper, or cabbage. I sometimes add fresh spinach during the last 3 minutes of cooking until wilted for another nutritious boost. For a different flavor, swap out the beef for Italian Sausage. There really are so many options. Hope you enjoy! In a large Dutch Oven cook beef, carrots, celery and onion over medium heat until meat it is no longer pink. Drain. Add the diced zucchini and minced garlic, cook for 2 minutes. Add broth, beans, tomatoes, tomato paste, bay leaves, Italian Seasoning, pepper, red pepper flakes. Bring to a boil. Reduce heat and simmer covered for about 30 minutes. Uncover and add pasta. Simmer uncovered until pasta is al dente, about 6-8 minutes. Ladle into bowls and garnish with fresh Italian Parsley and Parmesan Cheese. Cook's Note: This soup freezes really well. Cook it up to the point before you add the pasta. I ladle into ziplock bags and freeze flat in the freezer. When your ready to use, just thaw and heat soup to a simmer and add your pasta. Cook until pasta is al dente.